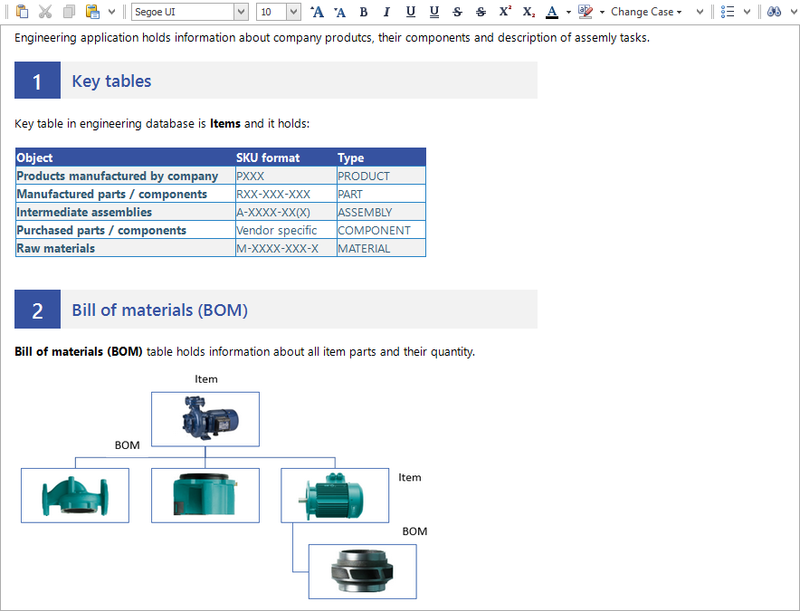 Dataedo exports documentation to beautiful HTML, PDF and Excel documents. 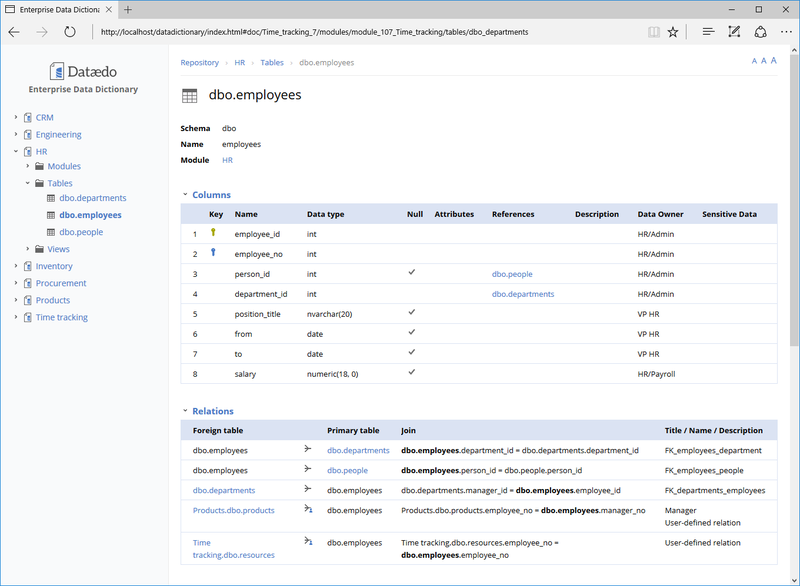 Dataedo is designed for documentation in agile environments. We understand that many databases are being developed constantly. Dataedo enables you to easily import changes in the source database to make sure you are documenting the most up to date state of your database. Within Dataedo interface you can browse progress of documentation and see which objects still need to be described. 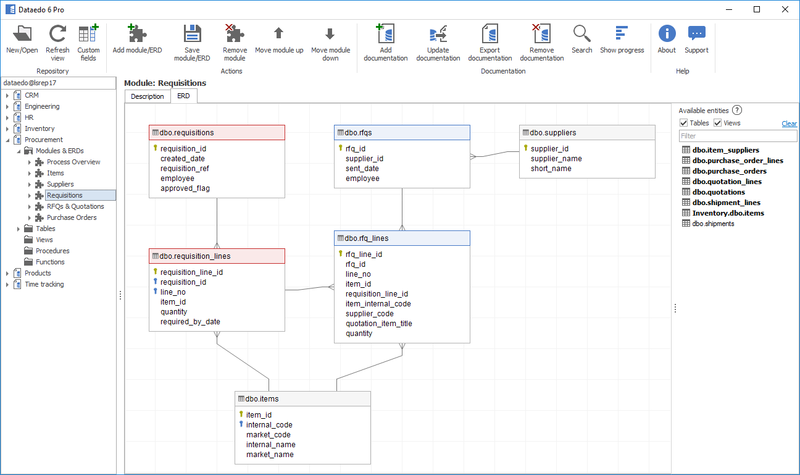 Dataedo enables you to define modules that can represent subject areas or topics and split large databases into smaller, more comprehensible pieces. Describe objects and modules using Word-like rich text editors. Paste existing documentation, diagrams and images. 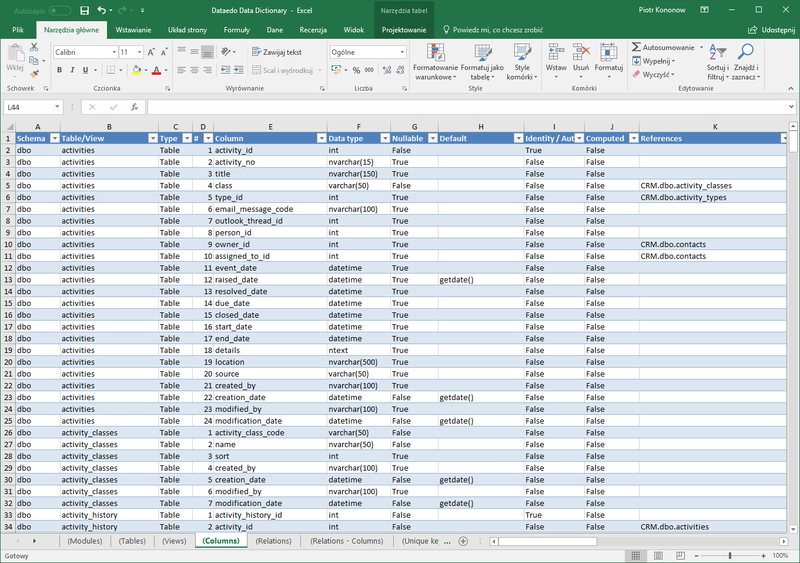 You can add custom plain text fields to almost any data element and document who data owner is, whether column holds sensitive data, what the source of the data is or what is the expected format and so on. Names of physical database objects can often be misleading and confusing. You can provide aliases for data elements (e.g. table or column) making it more comprehensible. 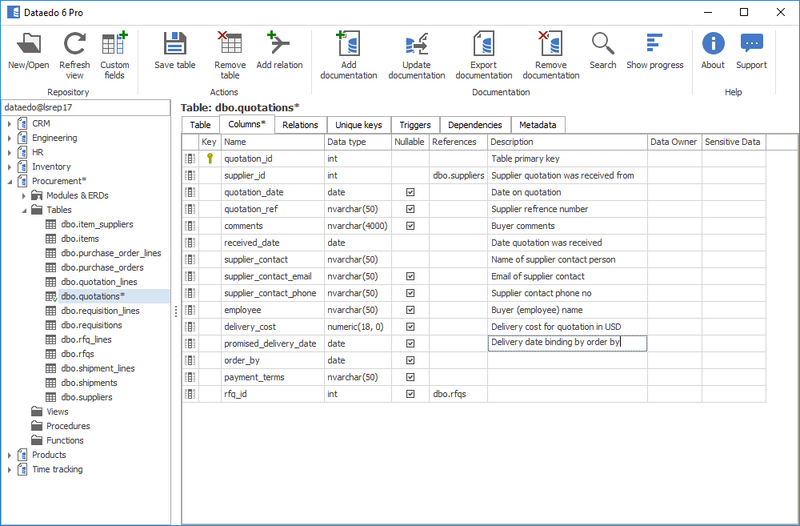 Dataedo keeps all its data in open repository that is a plain documented SQL database. This repository can be used to keep documentation for all your databases. Use SQL to read and write metadata. 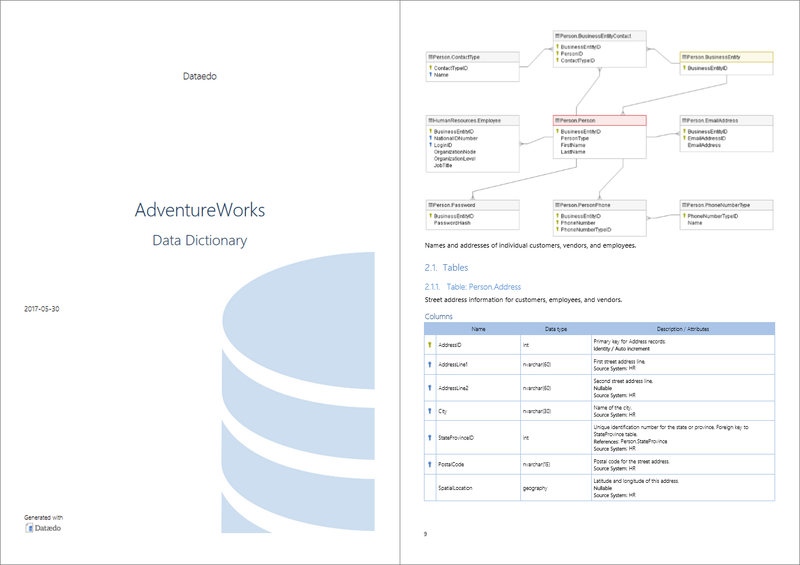 Search feature enables you to documentation for keywords. You automate documentation process and incorporate it into your development and maintenance procedures. Run import and export from command line or run custom scritps triggered with events. Dataedo reads and writes descriptions and extended properties to your database. You can read and save documentation you create. Dataedo will have database interface that allows you to import metadata from other external sources like unsupported databases, metadata repositories or data modeling tools. Set up different repositories for different environments - Dev/UAT/Live or various versions of your system and copy metadata across them. Define access permissions to each database in the repository. All data kept secure in your network on your servers. Documentation can be performed offline, without access to live databases. Modern, intuitive desktop user interface.